UPDATE: We got some more details about this event from Albert today and thought you might like an update. "Alliance and AirTek raised over $6,000 for the drive. 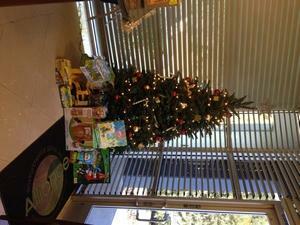 With the help of Target in Azusa we were able to purchase over 600 toys and 10 bikes for the event." There is nothing like a new bike for Christmas and 10 children got their dearest wish! Thank you so much to Target in Azusa and to everyone on our team! Great thanks again to Albert Rolon for his leadership! In case you missed it, here are the pictures in a short slideshow accompanied by the Marine Band. Don't miss the toy table or the smile on the face of the little girl with her new bike! We hope you had a wonderful weekend-before-the-weekend-before. We sure did!